Use our easy and secure shopping cart to place your order. Local and international customers please call 952-931-0255. Our business hours are; Monday through Friday, 8 AM to 4:30 PM (Central Time). The invoice will say 1 e-mail Order at $0.01. This is correct. We will take the item and cost information from your e-mail. You can also fax your order to 952-931-7948 (24 hours). The invoice will say 1 Fax Order at $0.01. This is correct. We will take the item and cost information from your fax. 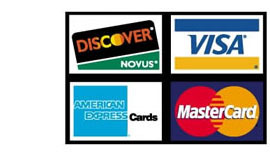 You can charge your order using American Express, Discover, Master Card or Visa. Once you set up an account on-line, you may choose to have our secure server remember your account information for future purchases. Orders shipped within Minnesota will have 7.275% sales tax added to the order. Call or e-mail us with any questions or concerns regarding payment options and terms.